Or should I say 'I did it!' 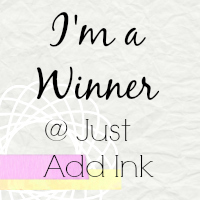 Last week I was picked as the winner of the Just Add Ink #294 challenge. It was my first ever win of a challenge so I was a bit excited! You can see the card I made here. 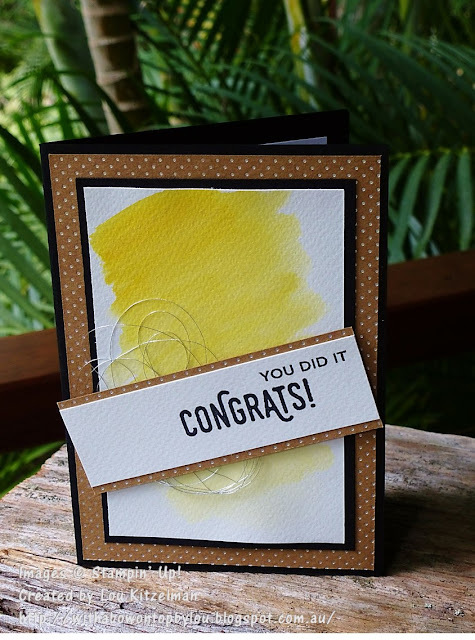 To celebrate I made a few congrats cards. 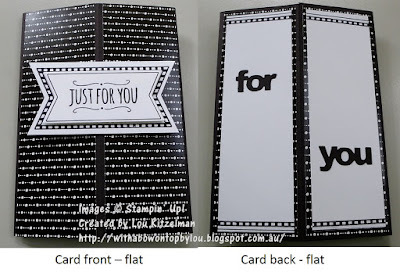 Is it bad form to make yourself a card??? I wanted to make some simple cards and these 3 are all just variations on a theme. 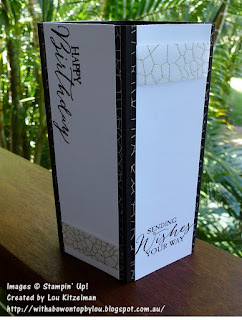 Adding an extra mat piece of black for example can turn a basic design into something more special. 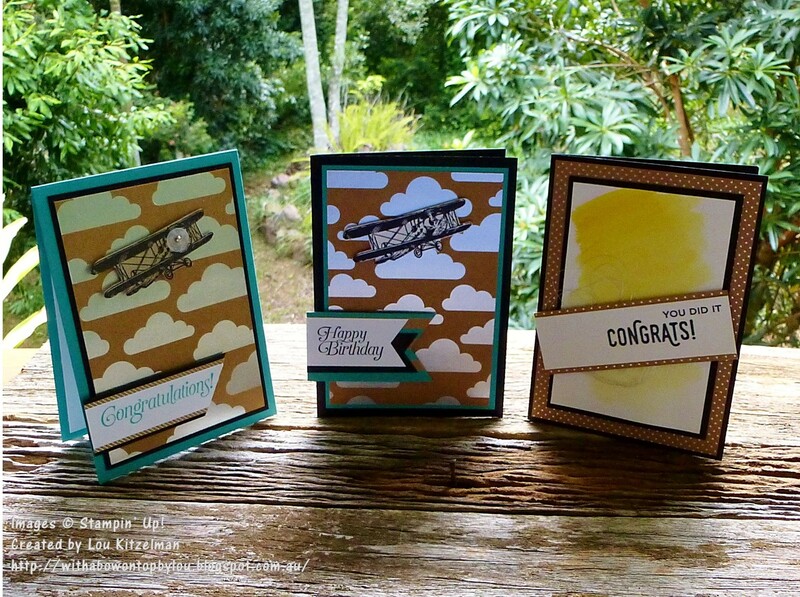 All 3 cards use pieces of paper from the Shine On Speciality DSP pack. Each piece has one side with silver foil printing. Unfortunately the Sunshine Coast has been decidedly unsunny so my photos don't show the beautiful shine. You'll just have to get some to see for yourself. 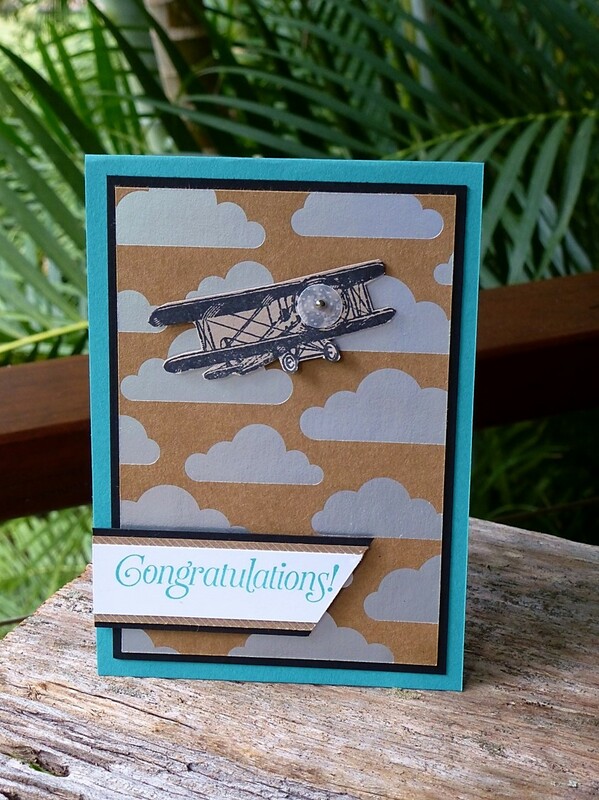 For my Congratulations (to me) card I have used the Sky is the Limit stamp set. It is free if you spend over $90 at the moment from any current Stampin' Up! catalogue. It is only available for another 2 weeks so get in quick. The plane has been stamped onto Crumb Cake cardstock, fussy cut and adhered with foam dots behind. Watercolour backgrounds are right on trend at the moment - and they are so simple to do. Grab an ink pad and an aqua painter and make a wash on watercolour paper, letting the colour fade out. 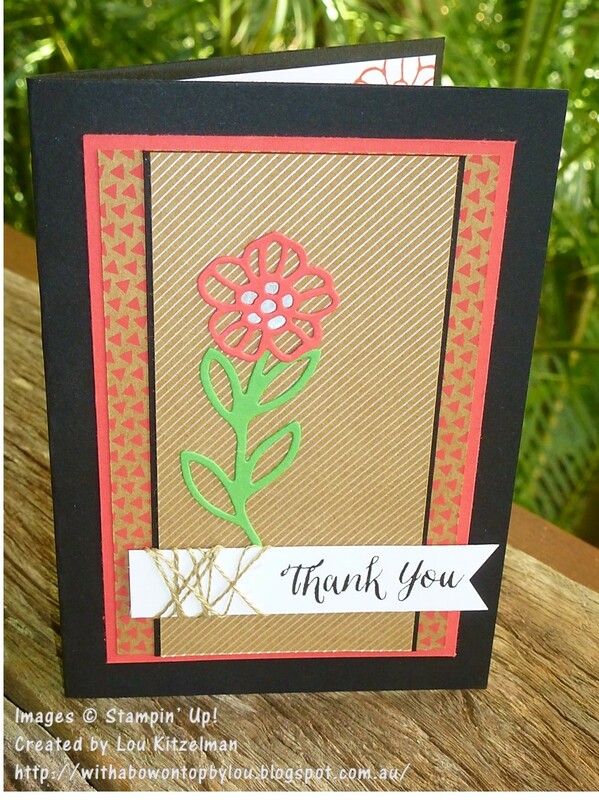 I love how the spots on this piece of DSP make a great border for the sentiment. 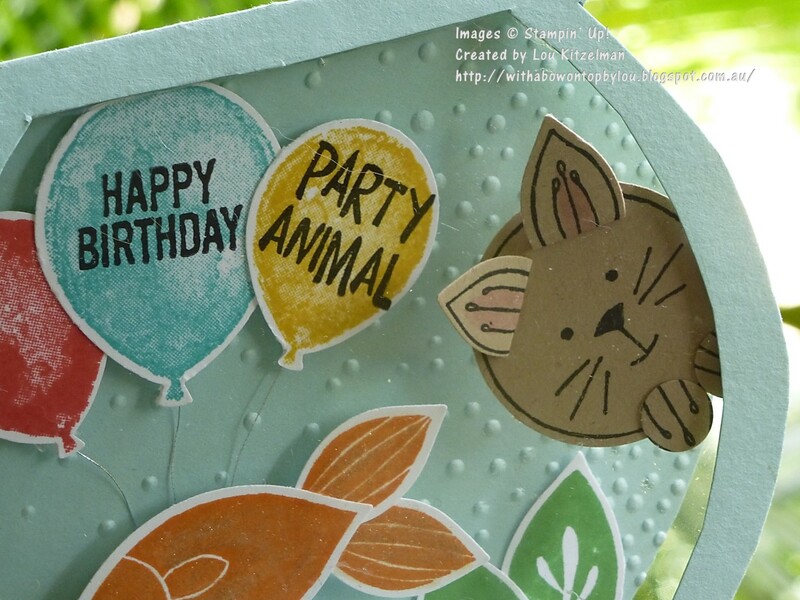 This sentiment is from another free stamp set called Perfect Pairings. 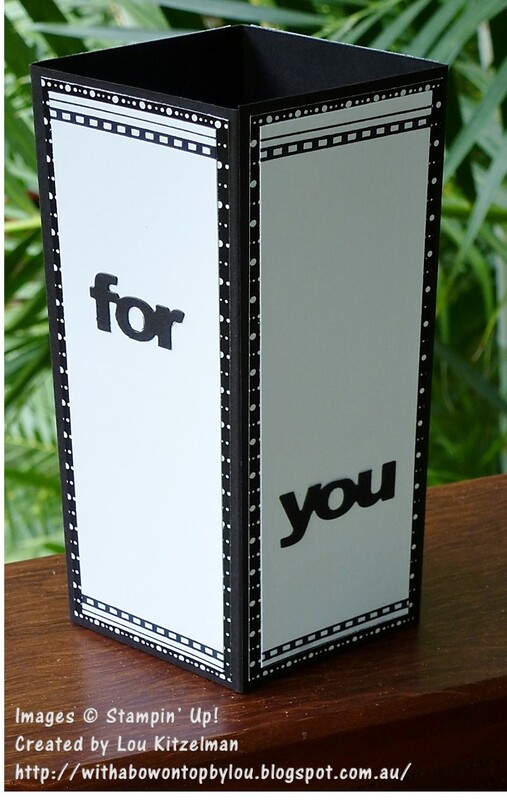 It has large sentiments with little phrases to add to them. Very versatile! 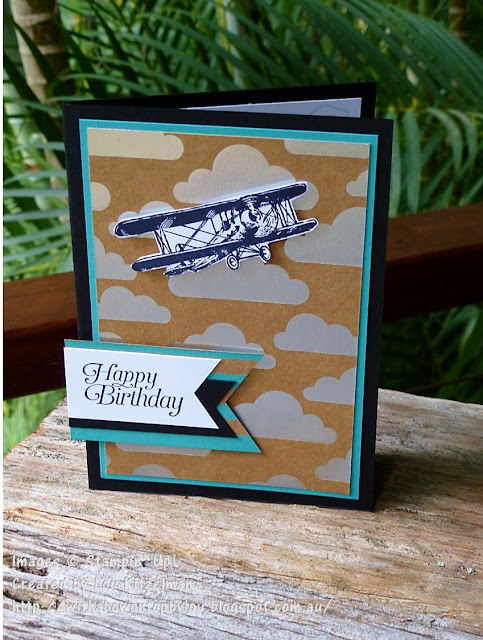 And since the Sky is the Limit stamp set is only available for 2 more weeks I thought I would make a birthday card as well. 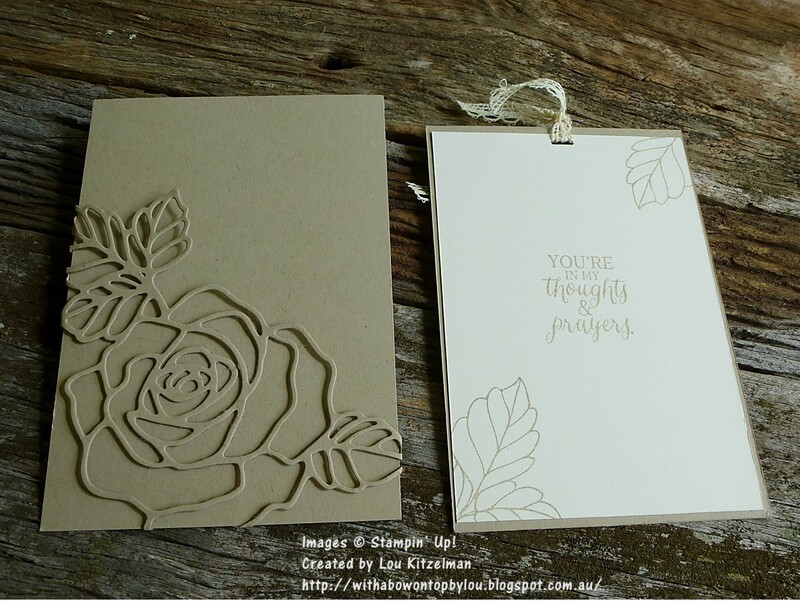 There are beautiful, versatile sentiments in this set. I'll be out of action for a few weeks so there won't be a post in that time. But I will be back. My list of ideas is so long I don't know if I'll ever get to them all! 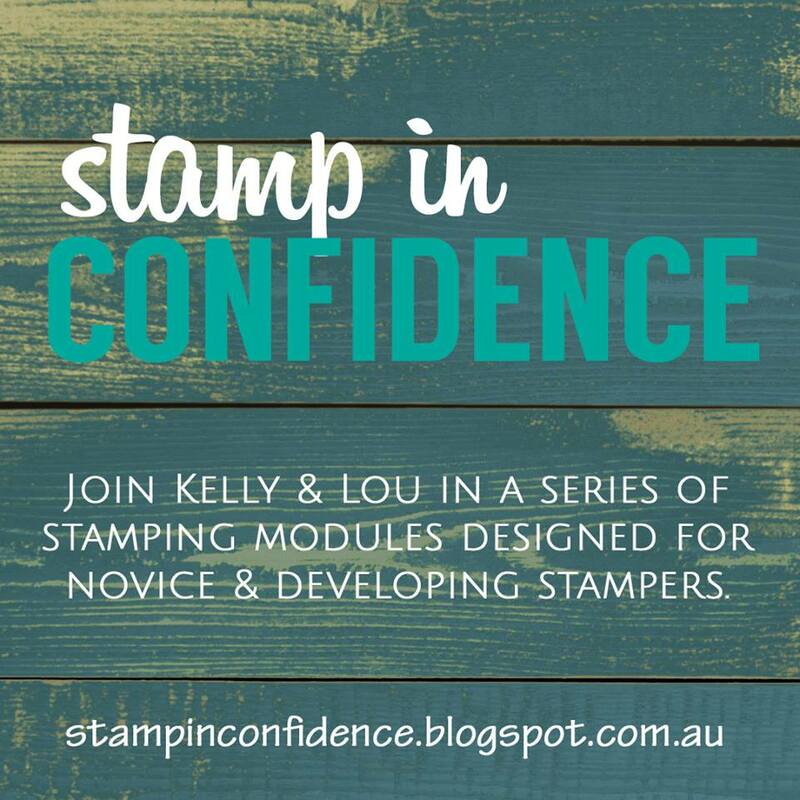 Have you had a chance to play with any of the new products in the 2016 Stampin' Up! Occasions Catalogue yet? 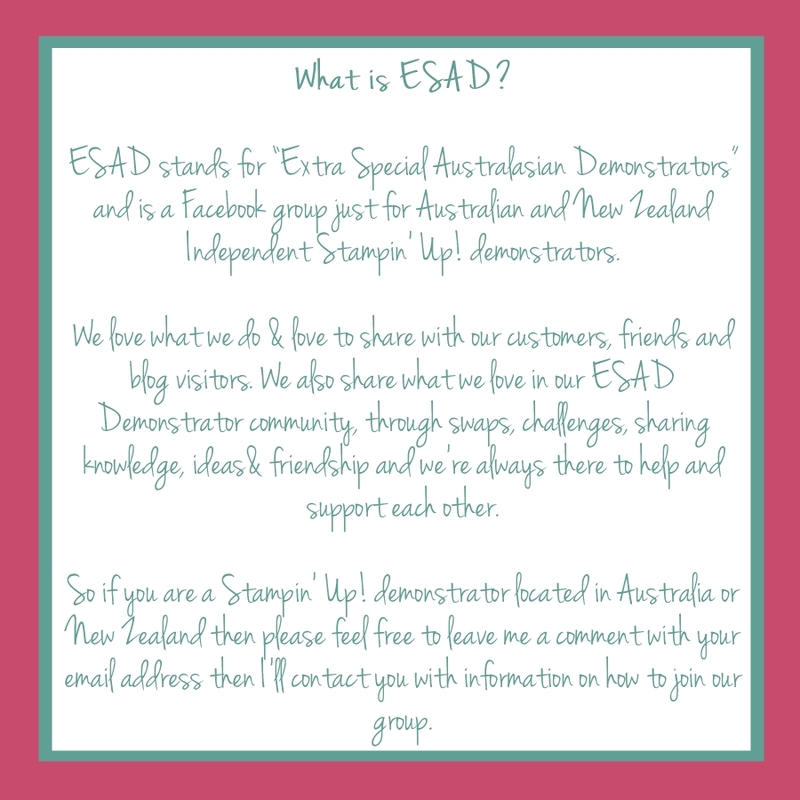 This ESAD blog hop will be the perfect way to get you started with ideas. 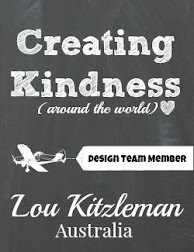 Whether you have just arrived from Libby's blog or started with me - welcome. Make sure to click each link to see all of the wonderful creations. There are so many great products it is hard to know where to start. Today I have some great cards to show you using the Rose Wonder stamp set and Rose Garden thinlits dies. 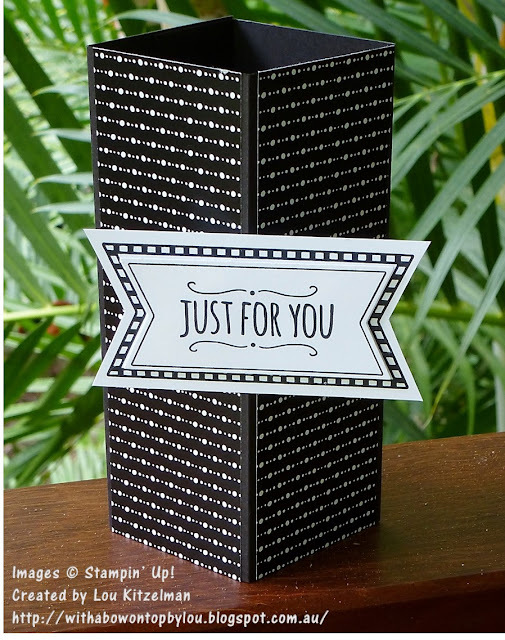 This stamp set is so versatile with many different sentiments in a beautiful font. Adding in the thinlits means that you can explore so many different techniques. I love multi-tasking products! 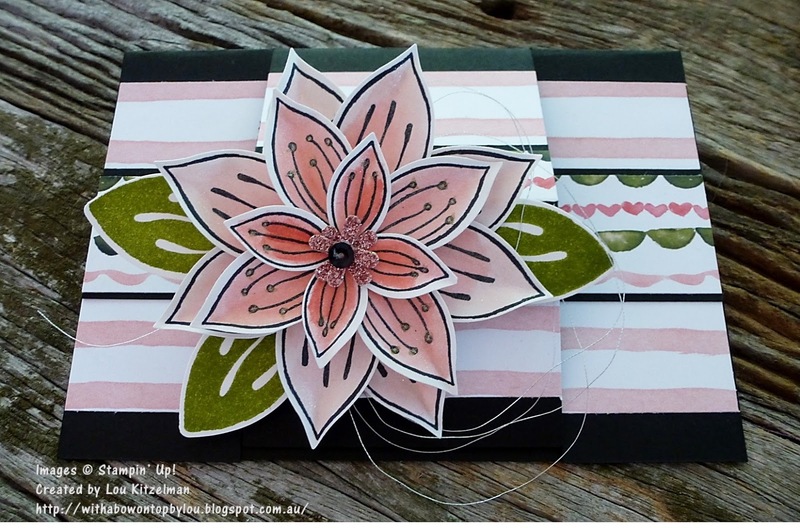 When I sat down to prepare for this blog hop everything seemed to align. I had the time, the inclination and the mojo! Not often they all line up! 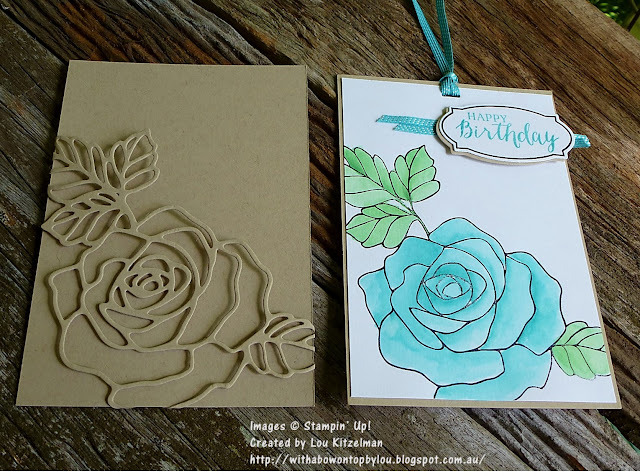 I got out my Rose Wonder stamp set and set about creating a card. 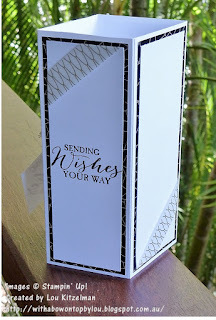 It is based on an idea with the die cut wrapping around the side to create a pocket that I caught a glimpse of at the Stampin' Up! Onstage event in November. Unfortunately I can't remember who the original designer is or find it online. Sorry to the designer but many thanks for the inspiration. 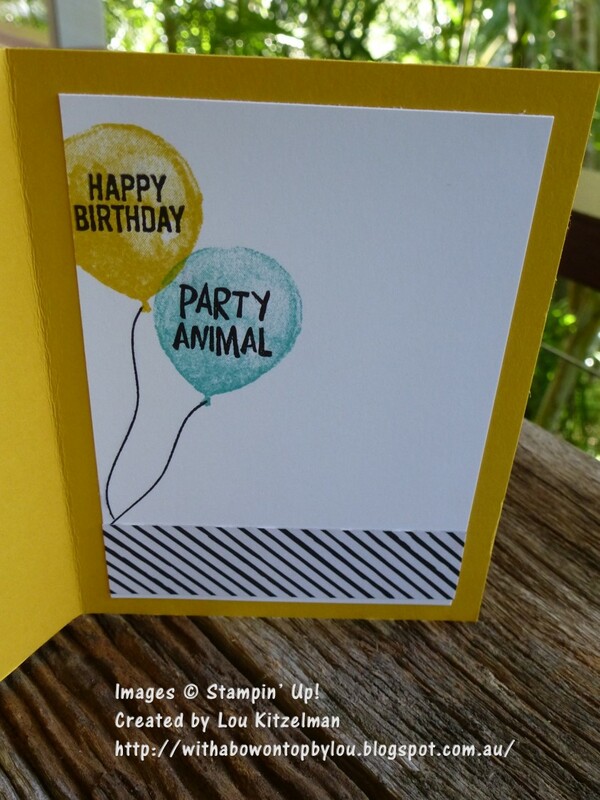 This card has a slide out message panel for a bit of fun. 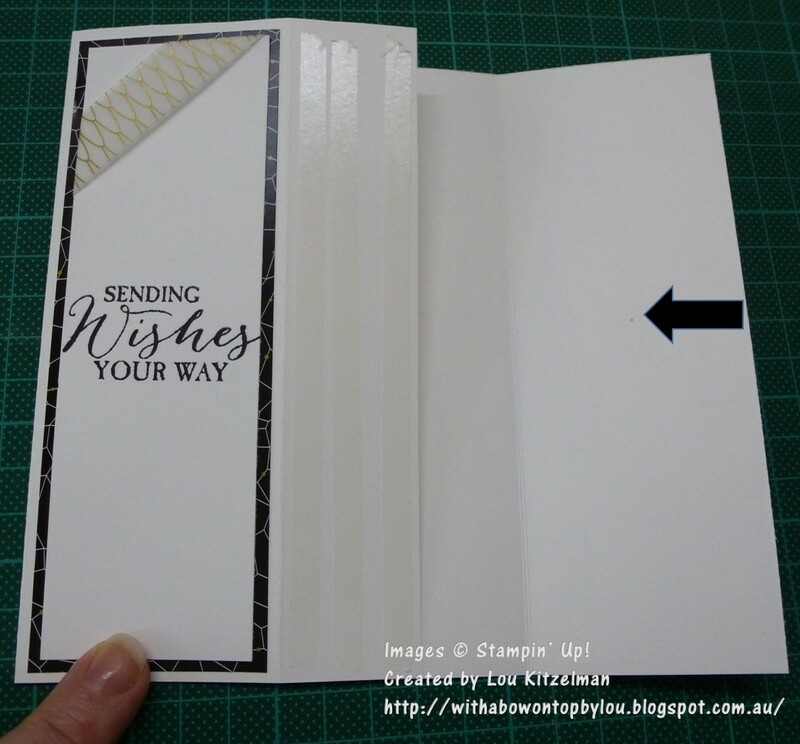 This pull out panel is cut a smidge narrower than the card base (which is 15 x 10.5 cm) so that it can easily slide. After diecutting the large rose with leaves I lay it over the Shimmery White piece to get a rough idea of stamp placement - making sure that I had some overhang to tuck around the sides and bottom. Stamp the matching stamp in Basic Black Archival ink so that your watercolouring won't smudge it. The brilliant thing about this bundle is that the large rose and leaves stamp matches with the die. The watercolouring is easy, yet effective. Grab an aqua painter and Bermuda Bay and Crushed Cucumber ink pads and colour away. Mount on the slide out base. I love that you also get a frame for all of those great sentiments in the set. 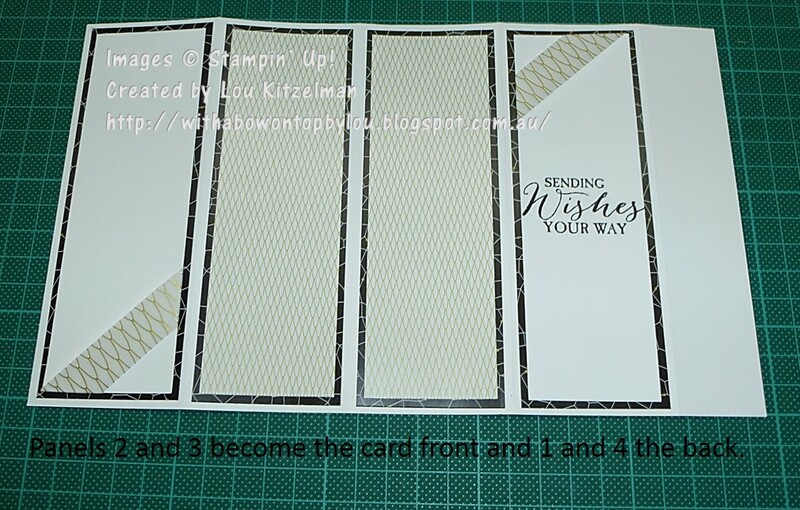 Cut out another piece of cardstock for the back message panel, decorate and mount on the back of the slide out base. 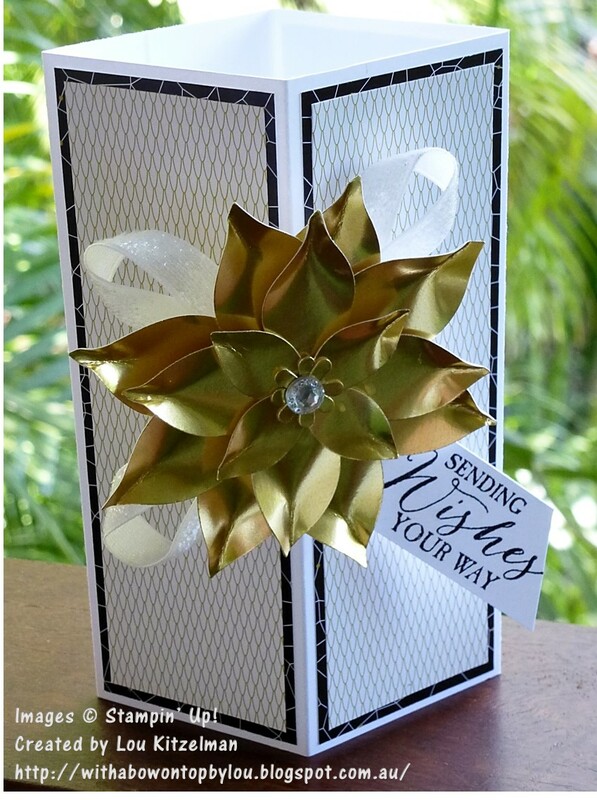 Add a ribbon slot using the Curvy Corner Trio punch and some of the beautiful new Bermuda Bay 1/8 " ribbon. Place the slide out base on the back piece, making sure it is centered and secure with paperclips. Lay the die cut rose over the top and secure with a paper clip when lined up and covering the black lines. Fold the overhanging edges over to the back and adhere with Multipurpose Liquid Glue. I am so happy with how it turned out. 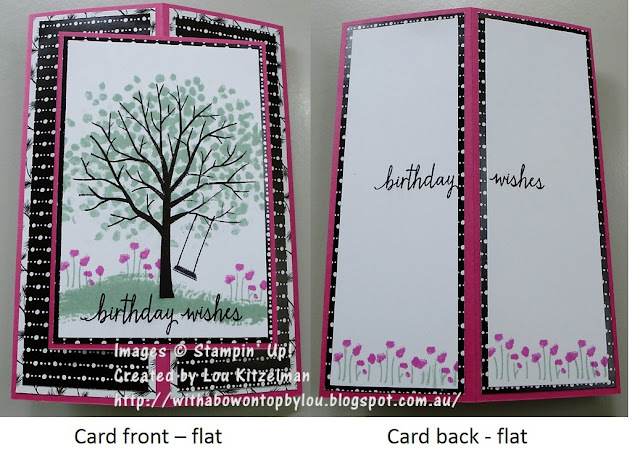 As I was making this card I had ideas whizzing around in my head and one thing let to another and before I knew it I had several more cards made. Here is a simpler version of the first card. 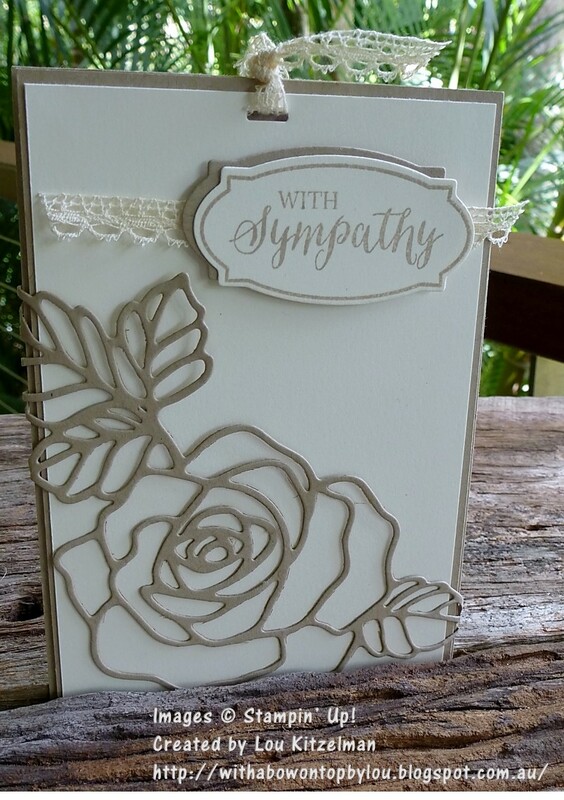 Perfect for a sympathy card. 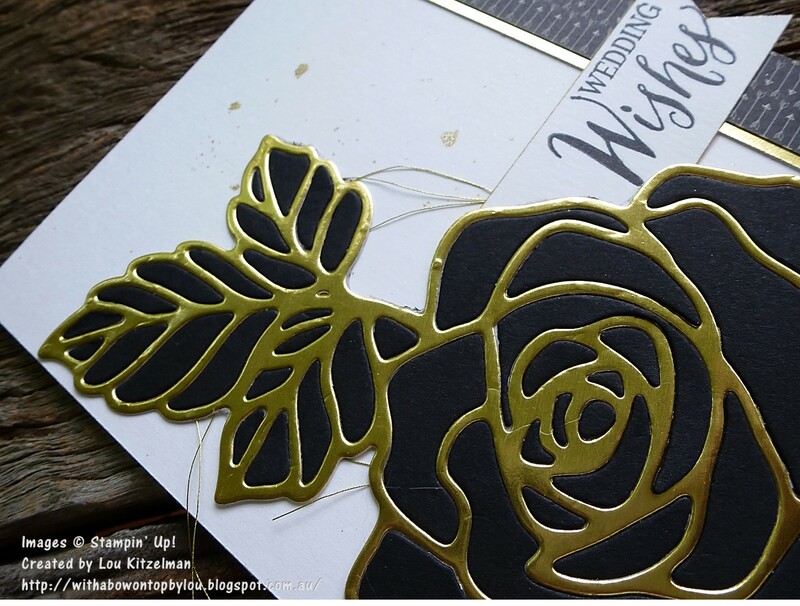 I wanted to die cut a gold rose for a wedding card but was thinking about all of the wastage of my precious gold foil sheet. So I decided to die cut a black rose and swap the inside pieces to give an inlaid effect. Word of advise - lock the cat out of the craft room! Do you know how hard it is to find that last tiny sliver of gold in a long hair cat? Why would you sit on the space cleared for you when you can sit on top of little intricate pieces that your person wants to use? So you get 2 cards for the price of one! After diecutting make sure that you carefully remove the pieces onto a piece of paper, trying to keep in some sort of order. 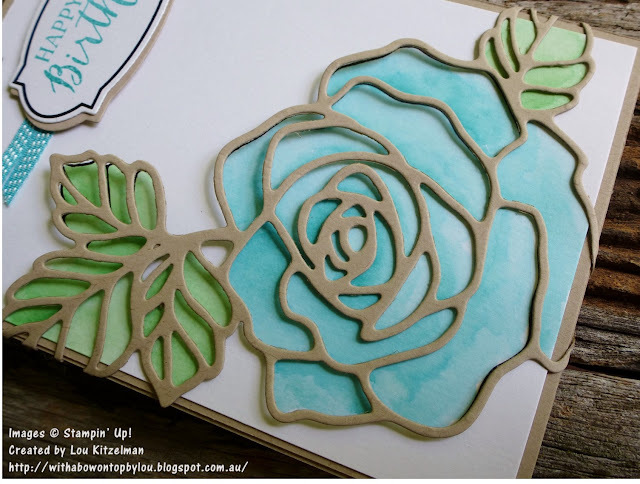 Roughly cut a piece of double sided adhesive sheet out and adhere to the back of the rose die cut. 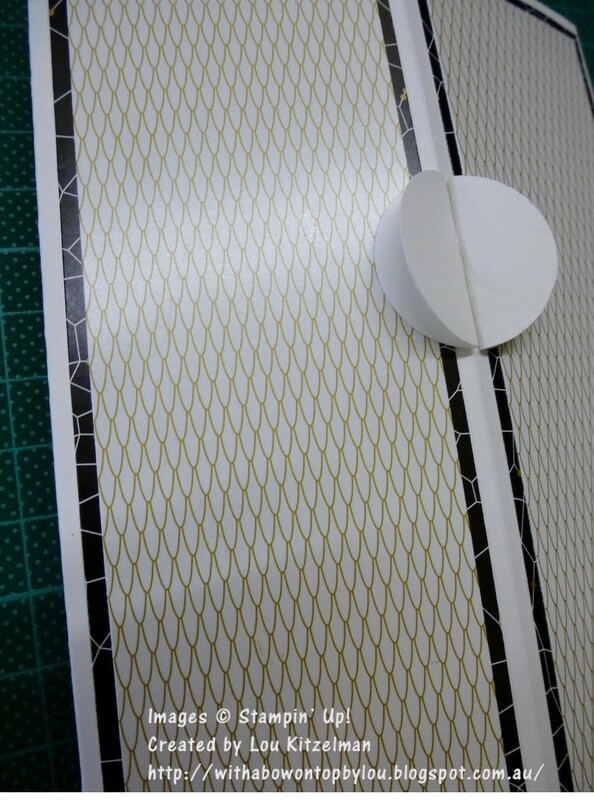 Then it is just like a jigsaw piece - slot each piece in. 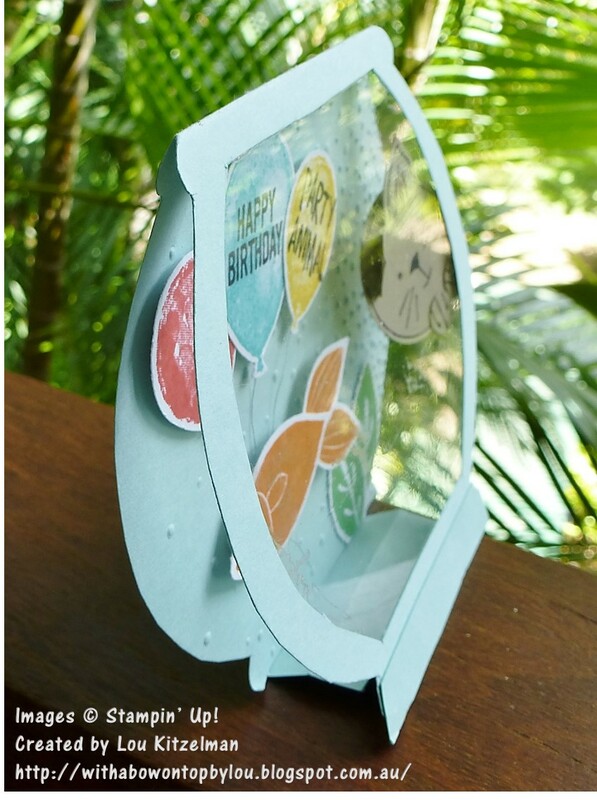 Using the adhesive sheet makes it really easy and keeps the pieces in place nicely. 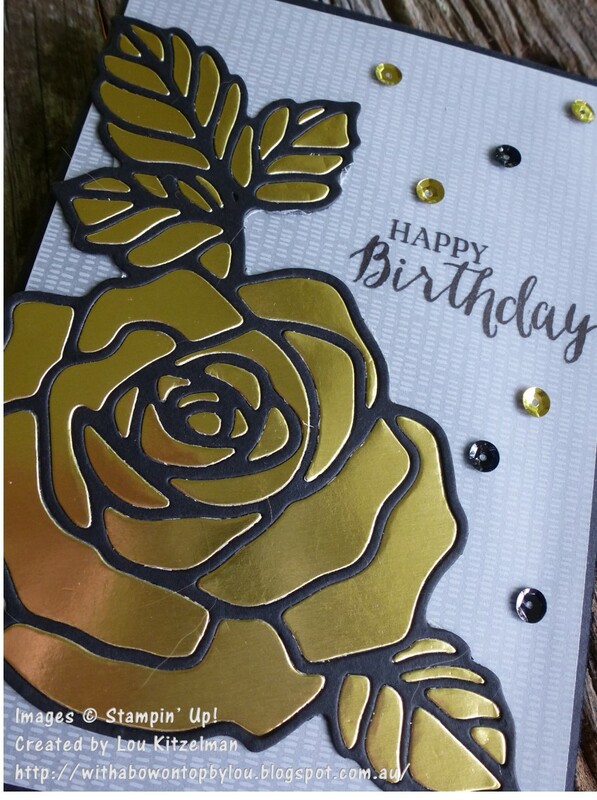 Sequins make a great cover for the glue dots I have used to adhere this Botanical Gardens Designer Vellum out of the Sale-a-bration catalogue. 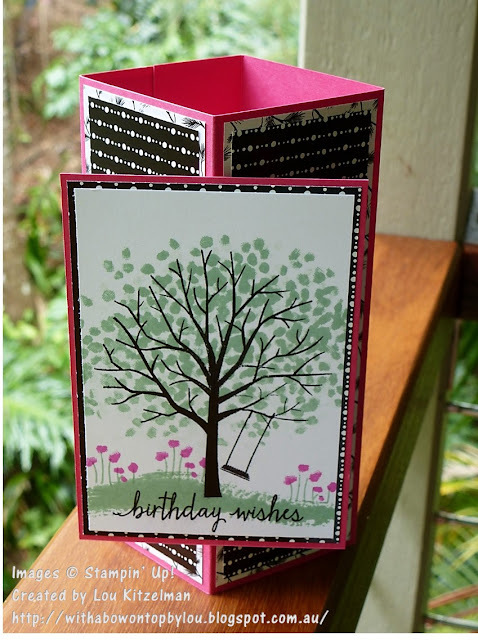 The Basic Black archival ink is perfect for stamping straight onto the vellum for a quick card. So I had managed to get this far without getting my new Wink of Stella Glitter Brush out but I couldn't control the urge to use it any longer! I've used the gold to add a splatter effect as well as to edge the sentiment tag. 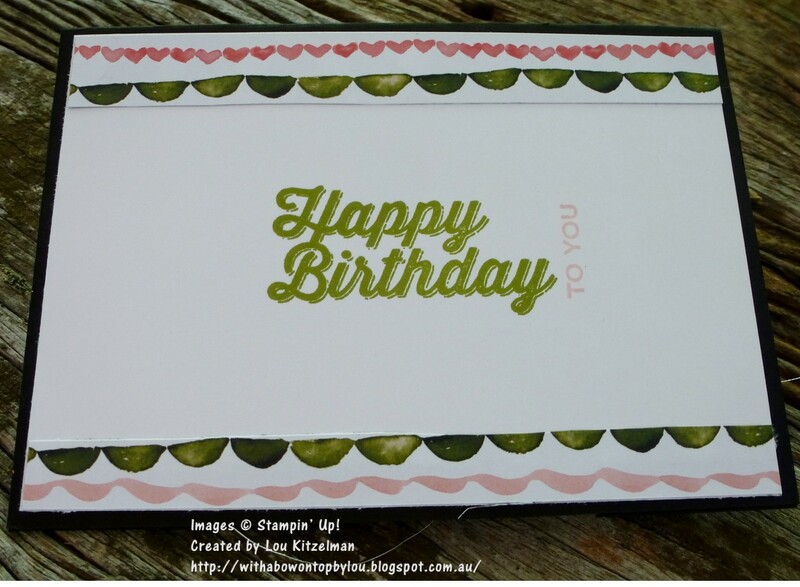 While on a roll I thought that I should use the other sentiments and thinlits I hadn't used yet. I was also itching to use paper from the Shine On Speciality DSP pack. 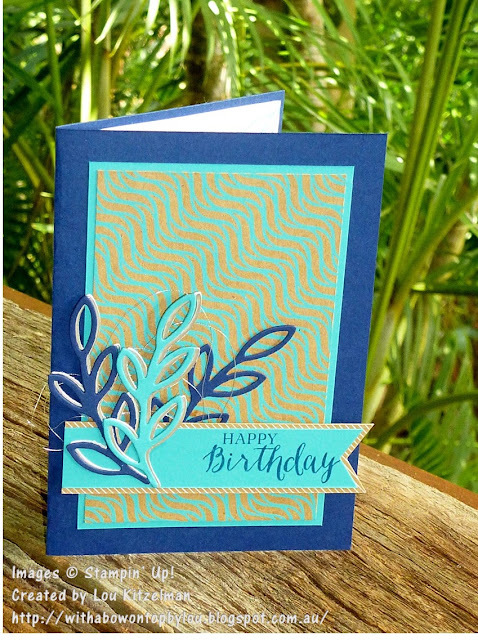 It has a Kraft background and each sheet has a silver foil design on one side. Gorgeous! This thank you card is very simple. To make the flower centre pop a bit I punched a 1/2 " circle from Silver Foil Sheet and glued behind. Not to leave the guys out I set about making a male card. This may not be strictly male - I'll settle for less girly! Layers of the leaf and stem have been adhered together, slightly offset to give a shadow effect. Thanks for stopping by. Make sure you check out this next blog from Nicole Wilson. 16. 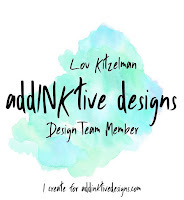 Lou Kitzelman - You are here! Here are the items I have used in these cards. 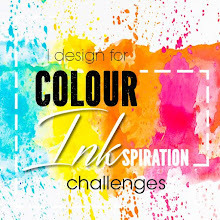 The Just Add Ink Challenge this week which is to Just Add Something New. My only dilemma was which new product to use! With the new 2016 Occasions and Sale-a-bration catalogues from Stampin' Up! recently released I had a few new things to choose from. 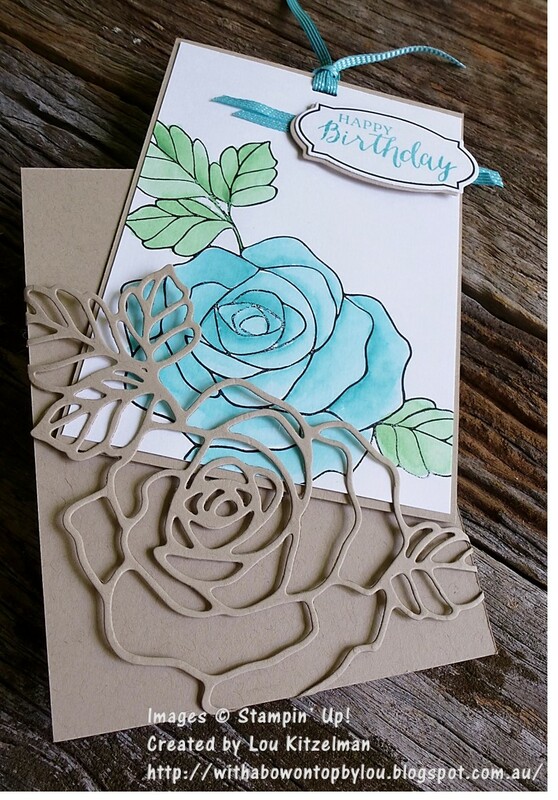 I decided to use the Friends & Flowers stamp set (with a few other things thrown in). It coordinates with the Festive Flower builder punch. If you are a regular follower you will know that I love that punch! This stamp set is full of possibilities. There are different flower petals and leaves, animal options and even a baby pea in a pod. 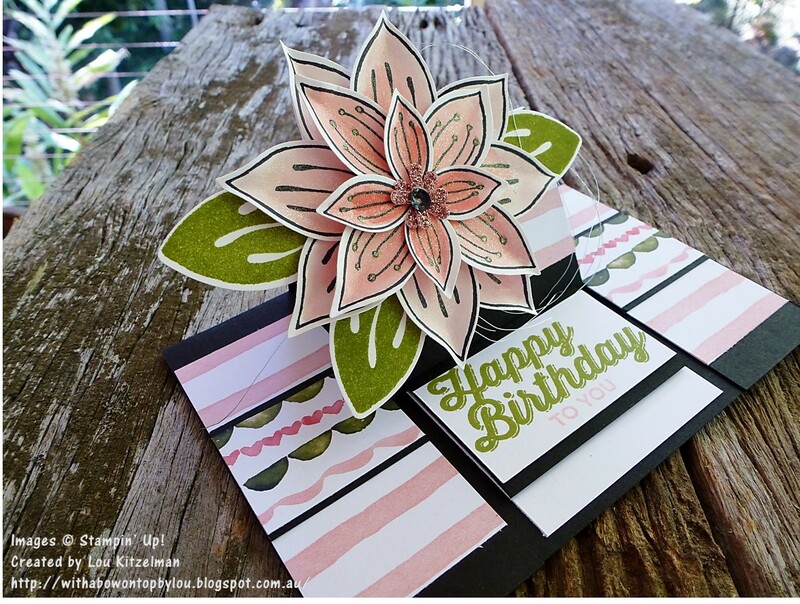 I went with the obvious for my first card - a flower! 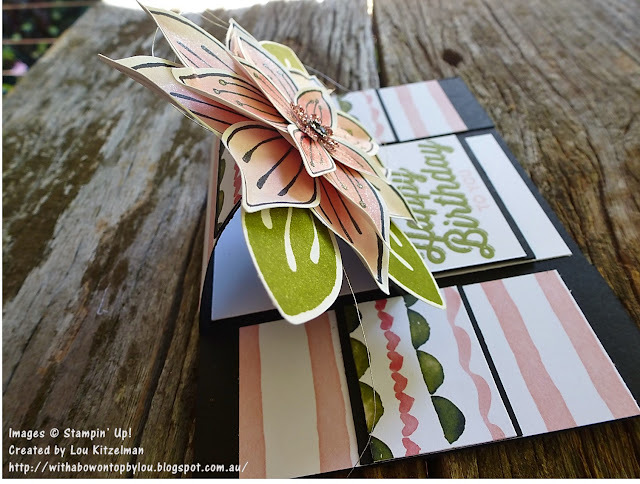 This is a super easy card fold that has been around for a long time called a Panelled Easel card. 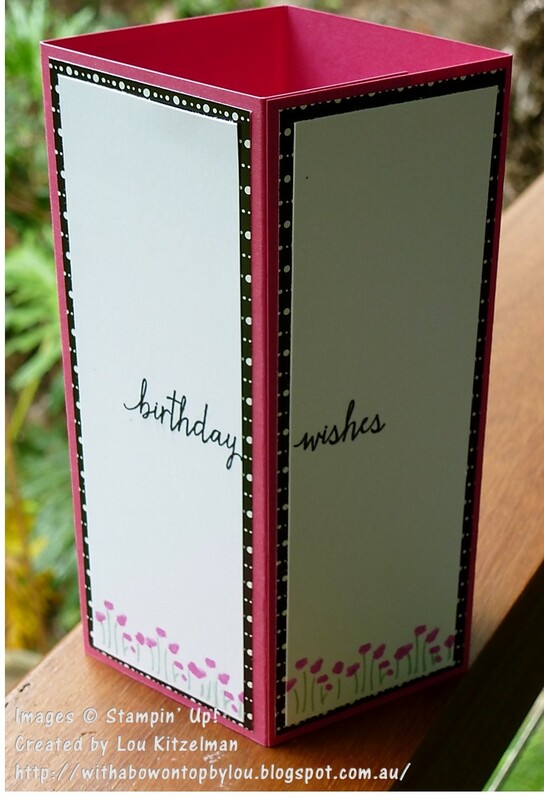 It is made like a normal card but the front it cut into 3 panels. I made the 2 outside 4 cm in width. These 2 outside panels are adhered down and the middle one becomes an easel. It looks nice flat (well nearly flat!) as well. 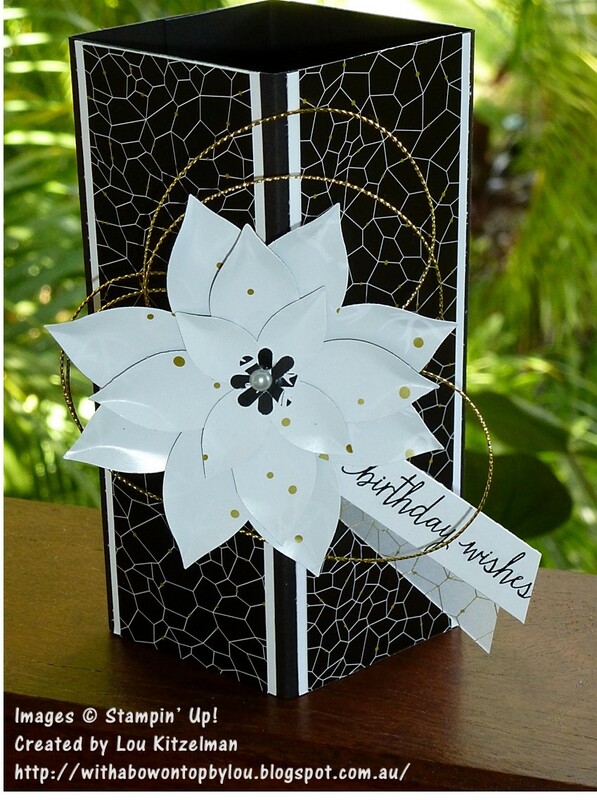 I have layered Basic Black cardstock with pieces of Birthday Bouquet DSP. Assembling the flower is really easy. I have some tips on how I do this in this post. 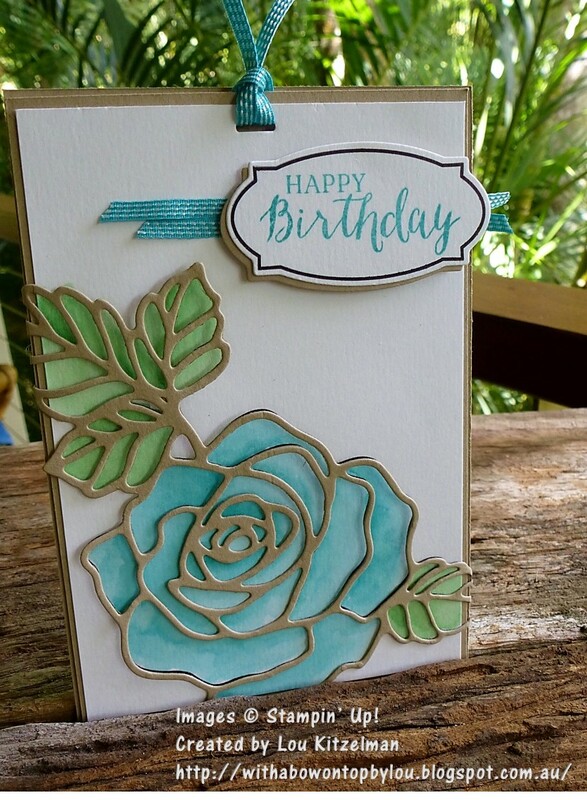 I stamped and punched the petals onto Shimmery White cardstock, punched then coloured using an aqua painter and Watermelon Wonder and Blushing Bride ink pads. My most favourite new thing is my Wink of Stella pens. After my petals were dry I brushed the clear lightly over each one. I love the subtle effect. 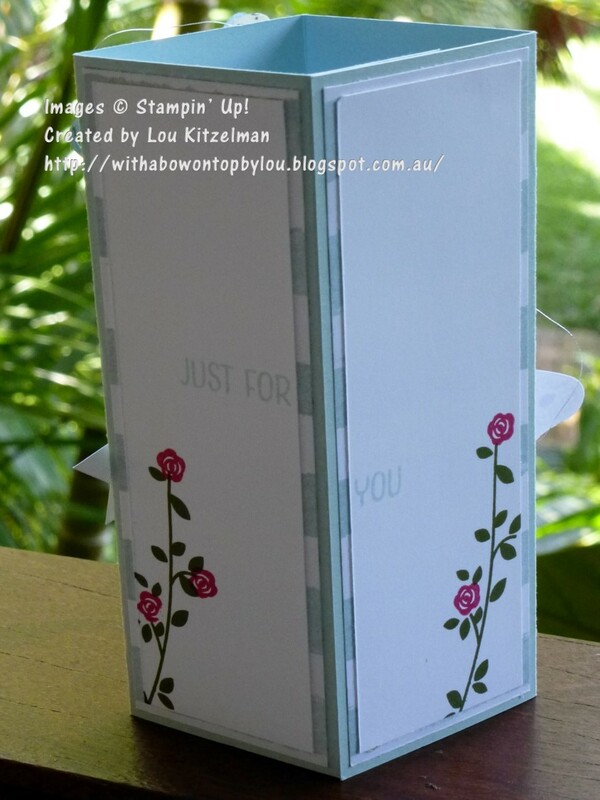 Blushing Bride glimmer paper sets off the centre. Remember to only adhere the flower to the bottom half of the easel section. The back of the card has a simple message panel. 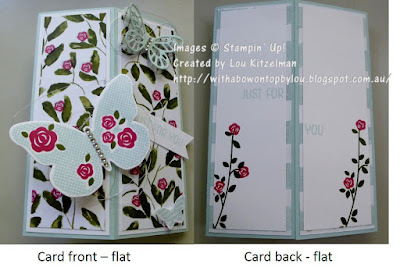 I have used one of the free stamp sets that you can choose from in the Sale-a-bration catalogue called Perfect Pairings. My next experiment with this set was to make a fish and a cat. Of course they needed a fish bowl to go in and some balloons from the Balloon Builder set. The Balloon Bouquet punch makes it so easy to punch the balloons. 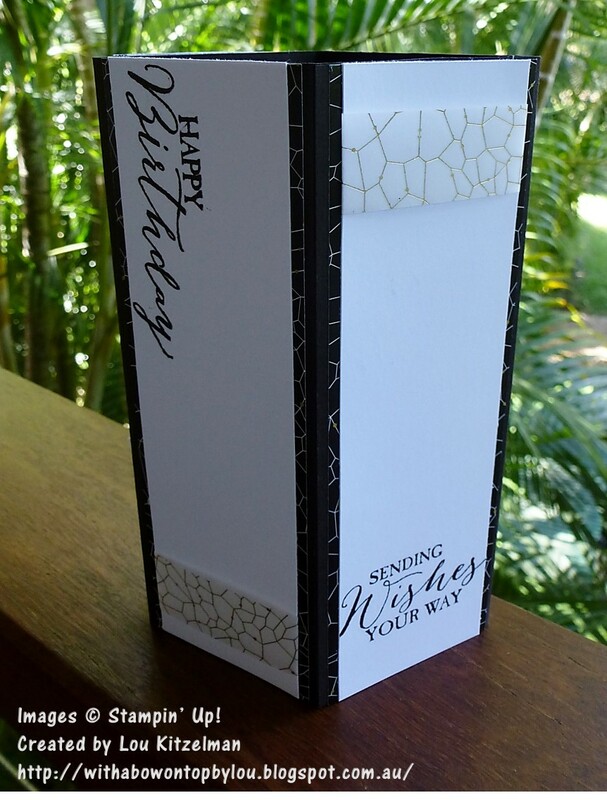 I made a concertina piece to allow the card to easily stand up. 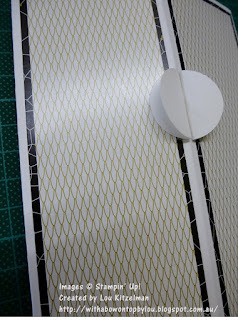 The back of the tank has been embossed with the Softly Falling TEIF to give the idea of depth. 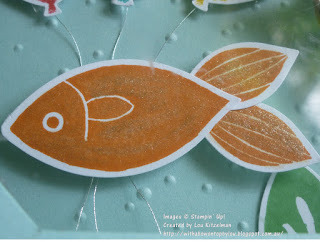 Of course every gold fish needs a Wink of Stella touch! I couldn't resist adding a cat. His ears and paws are made from one of the small double petals. Don't forget that up until the end of March you can choose free products for every $90 you spend on items from any current catalogue. 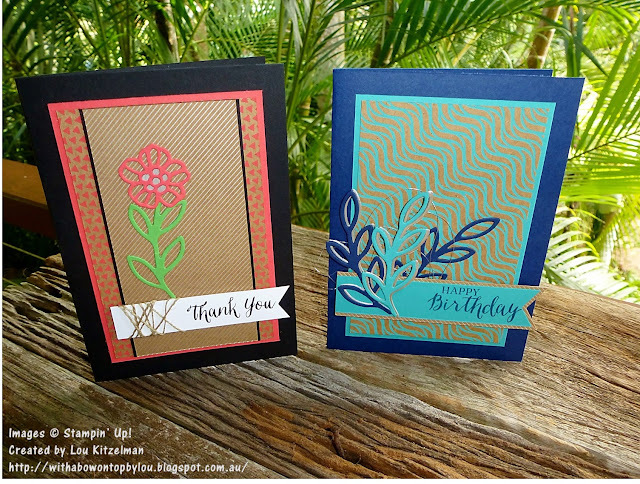 Here are the products I used to make these cards. You can click on them or on my shop link at the top right to order and have products sent straight to your door anywhere in Australia. 2016 Stampin' Up! Occassions Catalogue starts today - Yay! The day has finally arrived for you to be able to order from the new 2016 Occasions catalogue. Even better - for every $90 you spend from any current catalogue you get to choose a FREE item from the Sale-a-bration catalogue. There are so many great products in these catalogues. 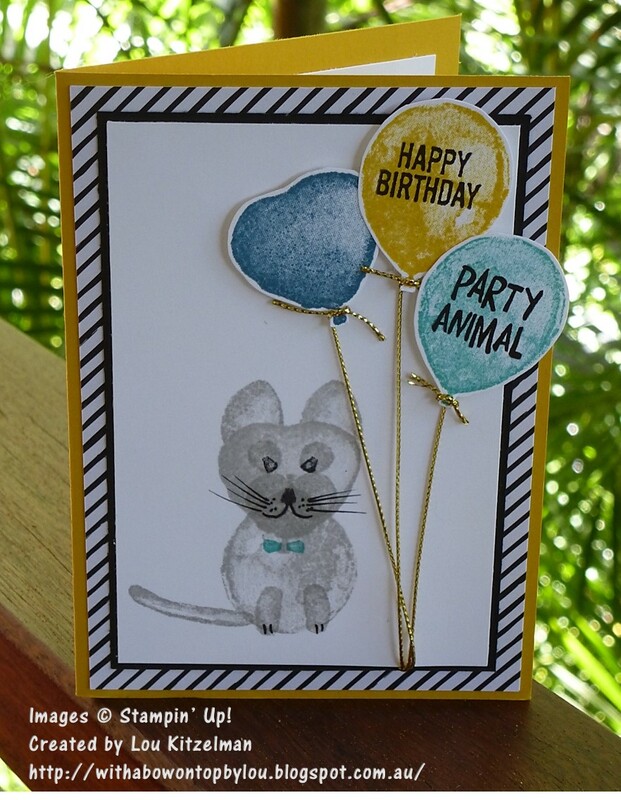 Here is a card I've called 'Balloon Cat' that I've made using one of the stamp sets that demonstrators were lucky enough to be given at the Onstage events in November. This stamp set is called Balloon Builders. It has so many images to use as you can see. Now I must admit that I am a recent convert to this set. When I first received it I wondered why we had been given a butcher set. Of course I need my glasses more and more now! Glasses on and the sausages became balloons. 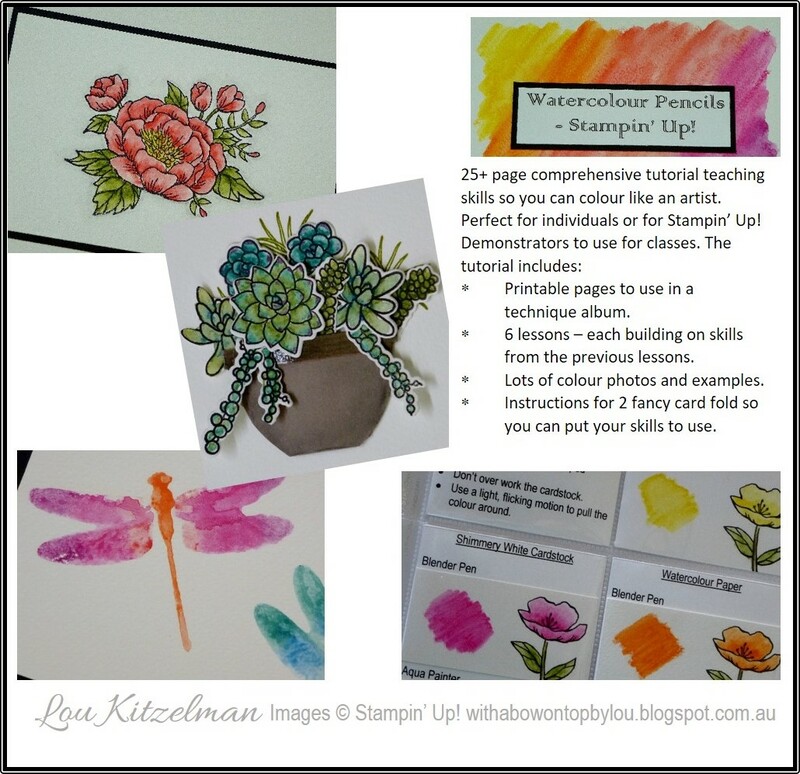 The catalogue has some great ideas for you to get creating. 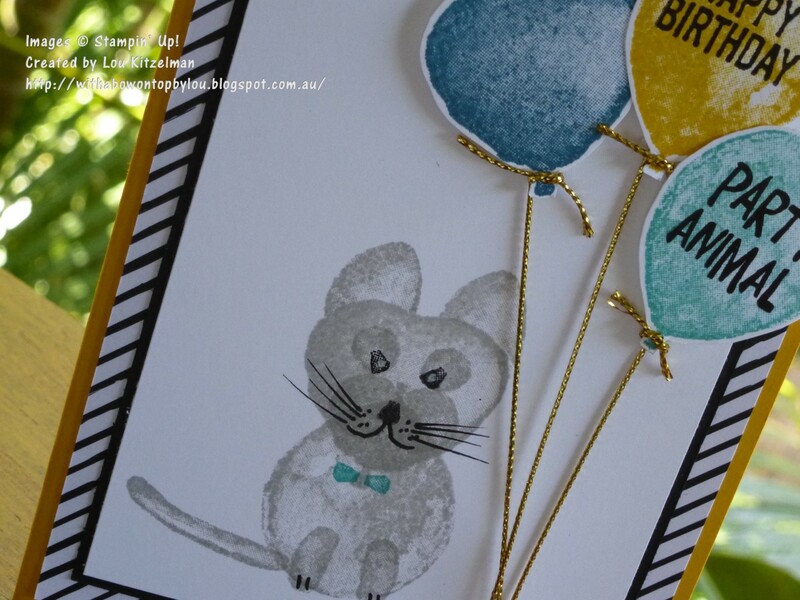 I am very happy with my cat and love how you can stamp the sentiments into the balloons. There is a new punch in the catalogue that punches out 2 different balloon sizes to coordinate with this set as well. Don't forget to show the inside of your card a bit of love as well. A simple strip of DSP and a stamped image is always a great touch. Well it's been 4 days now since my crafty New Year's resolution started and so far so good. You have to celebrate the little things don't you? 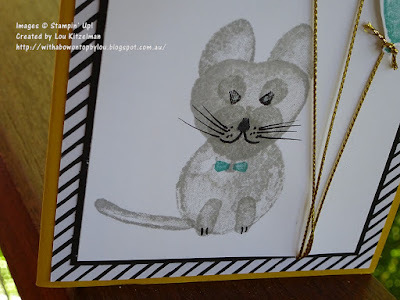 In my last post I showed you how to make some Decorative Corner Cards using my Christmas crafting leftovers. I've been on a roll - the lengths I go to to avoid cleaning my craft desk! My stash of Winter Wonderland DSP is dwindling. I decided to go for a clean and simple design for this card and have used the You're So Sweet stamp set and coordinating Mini Treat Bag thinlits dies. Notice how I have used the border of the Just for You stamp to add detail to the back panels? You can use large front panels with this card fold. 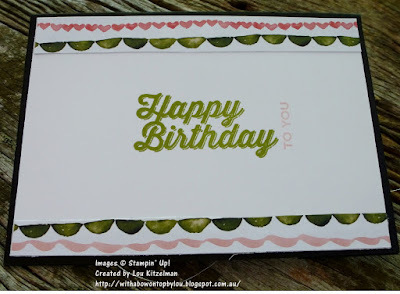 Here I have used the Sheltering Tree stamp set with pops of Melon Mambo and Mint Macaroon. This is a bit of a departure from my usual style but I do need to cater for all tastes. 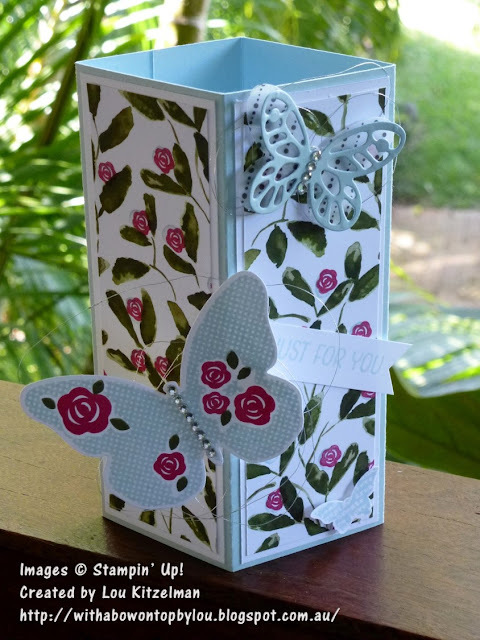 I have used the Floral Wings hostess set and stamped the small rose over the blue circles on this piece of DSP from the Season of Cheer DSP set and then used the other side (stripes) for the back. Happy New Year ... What it is your crafty New Year's resolution? Happy New Year to you all. I hope that 2016 is already off to a great start for you. I learnt long ago not to make wild New Year's resolutions - it can make you a bit unhappy with yourself if you fail! But this year (mostly due to a very messy craft desk full of my Christmas crafting products) I have decided that my crafty resolution should be to use all of my lovely Stampin' Up! products and not leave them for that 'special' project. Do you find that you can't cut into that special paper or use those extraspecial embellishents? 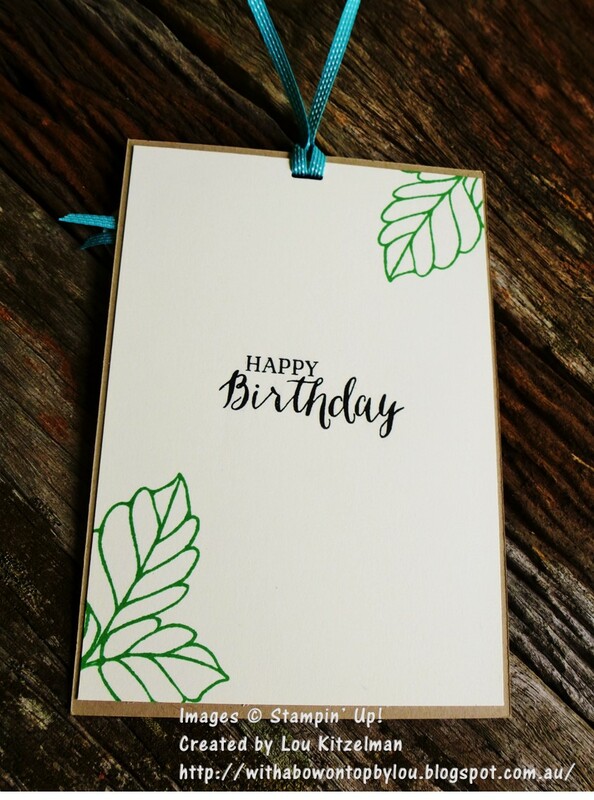 I think that I will still be discerning about who I give cards and gifts to using my really special products but use them I will! 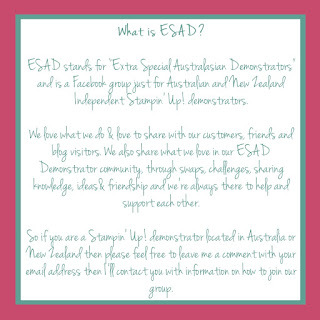 I'm sure I'm not alone when I tell you that I still have sheets of Designer Series Paper (DSP) from the first Australian Stampin' Up! catalogue. Lucky my resolution is from now on! In that same spirit (and maybe to lessen the amount of stuff I have to put away!) I have decided to use some of my Christmas supplies from the Holidays catalogue for non Christmas occassions. I can tell myself that I will use the DSP next Christmas but let's face it, next year I'll be in love with a new set of papers and embellishents. 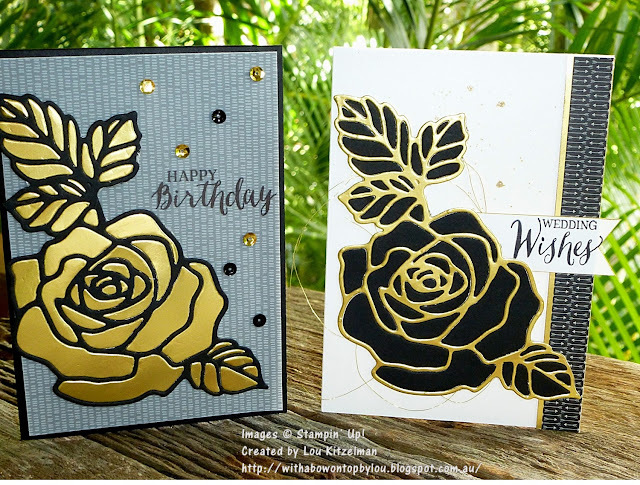 Of course I am itching to show you products from the new Occassions and Sale-a-bration Catalogues that will be launched in a few days on January 5th but we'll have 3 months for SAB and 5 for the Occasions catalogue to explore those products. I make cards to sell in a box where I go for Pilates and my stocks are running low so the more cards I can make the better. I like to make cards that are a bit differnt to the ones that you can buy in a shop and if they stand up for display it's a bonus. 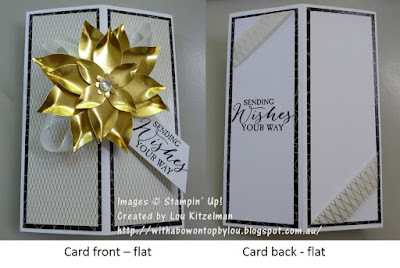 With that in mind the non-Christmas specific pieces of DSP that are on my desk will work really well with the card fold that I have recently learnt. Sometime in the last few months the weekly tutorial over at Splitcoast Stampers was for a Decorative Corner Card. It is so simple (why didn't I think of it?) and yet so effective. It looks way harder to make than it is. The fact that it packs flat to fit into a standard C6 envelope yet stands up for display makes it a real winner for me. You can see the tutorial here. There is a great video to go with it if you prefer to watch rather than read instructions. 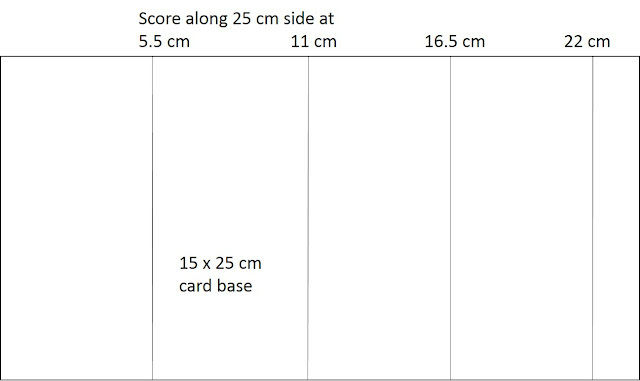 I have tweeked the measurements and method to work with metric measurements and whole centimetres (who can be bothered with millimeters after celebrating New Year's Eve?) but the basic construction is the same. You will see that they have cut a seperate piece to join the first and last corners but I have made mine all in one. You need a little over a half a piece of A4 cardstock so I figured I'd take a short cut. This is what my first finished cards look like. 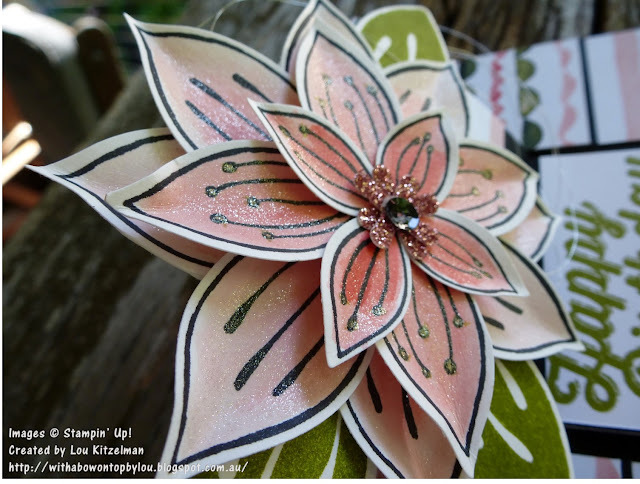 Did I mention that my Festive Flower Builder punch is weighing down my stack of Winter Wonderland DSP and vellum. Of course I had to use it as well! This it what the back of each card looks like. 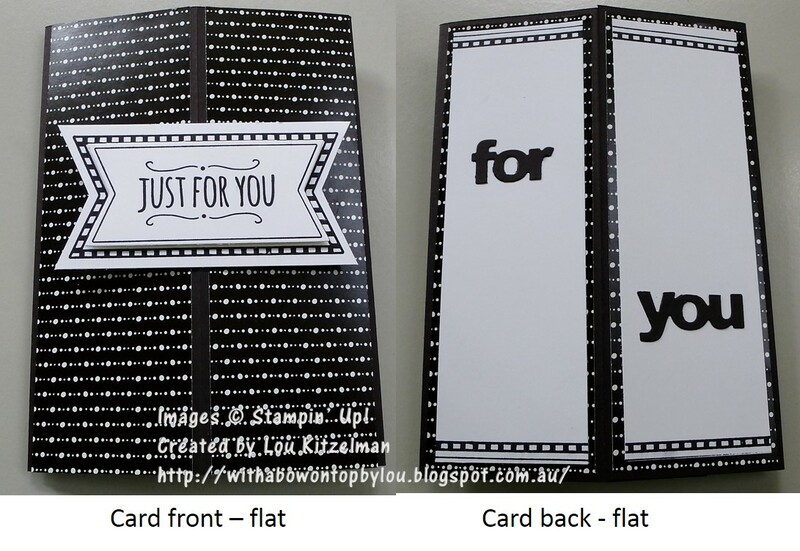 Flip the card over after attaching all of the panels and add adhesive the to small panel. 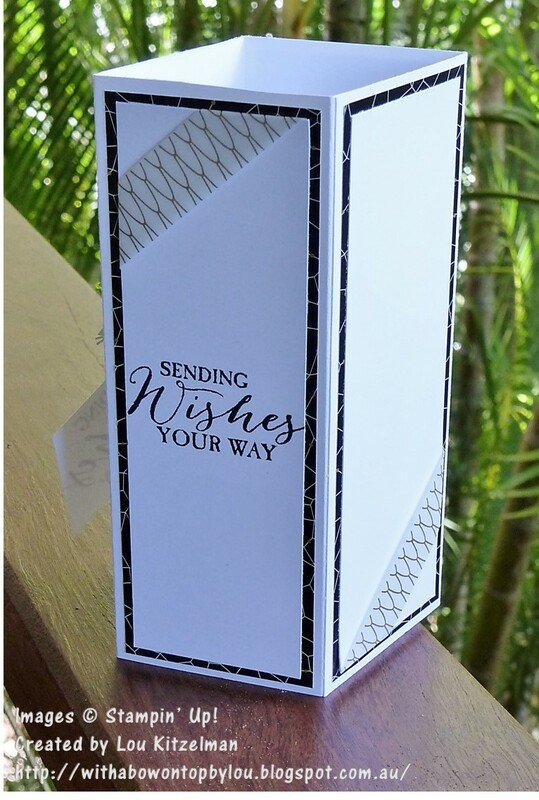 Use the picture below to construct the card. 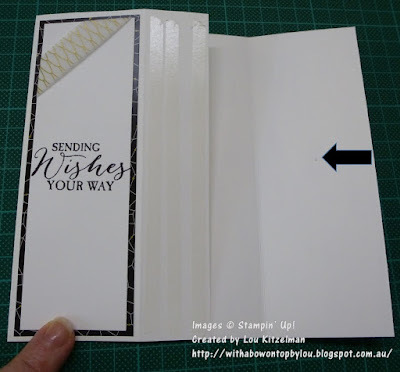 Doing it this way ensures that it still sits flat for the envelope. 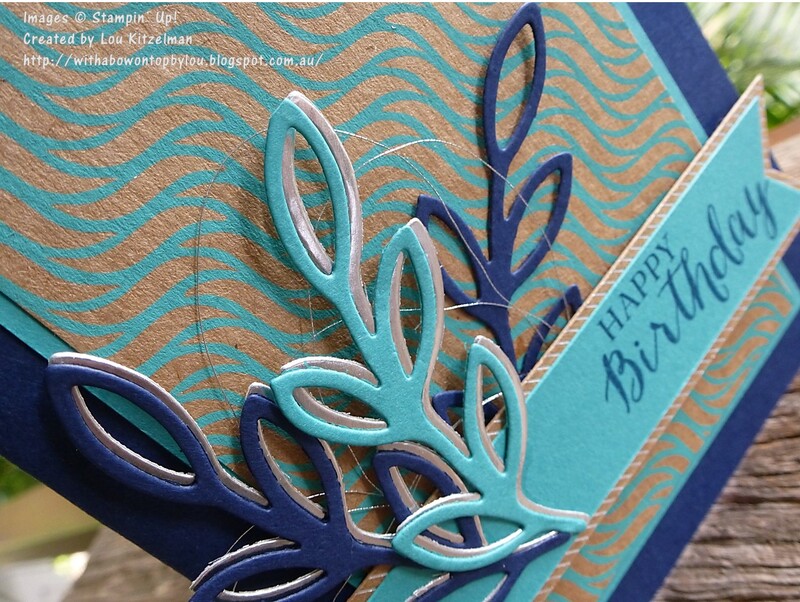 The ingenious way of attaching the 2 punched circles to allow the corner embellishment to "pop" is easy to do. 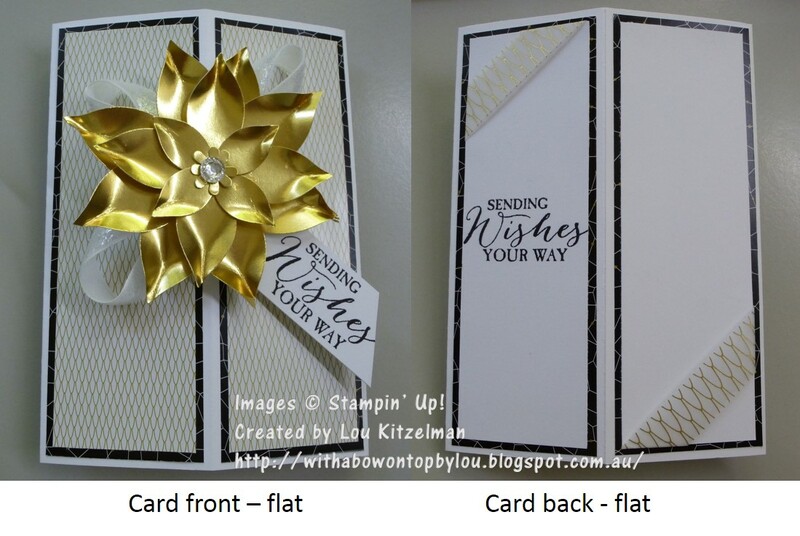 It also means that the card still looks great when folded flat. 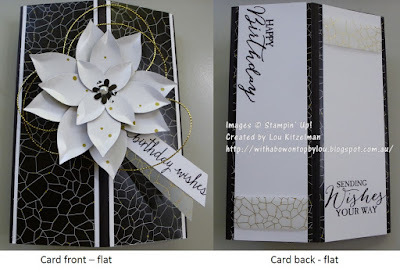 Glue each folded circle onto the card front - one either side of the fold line. 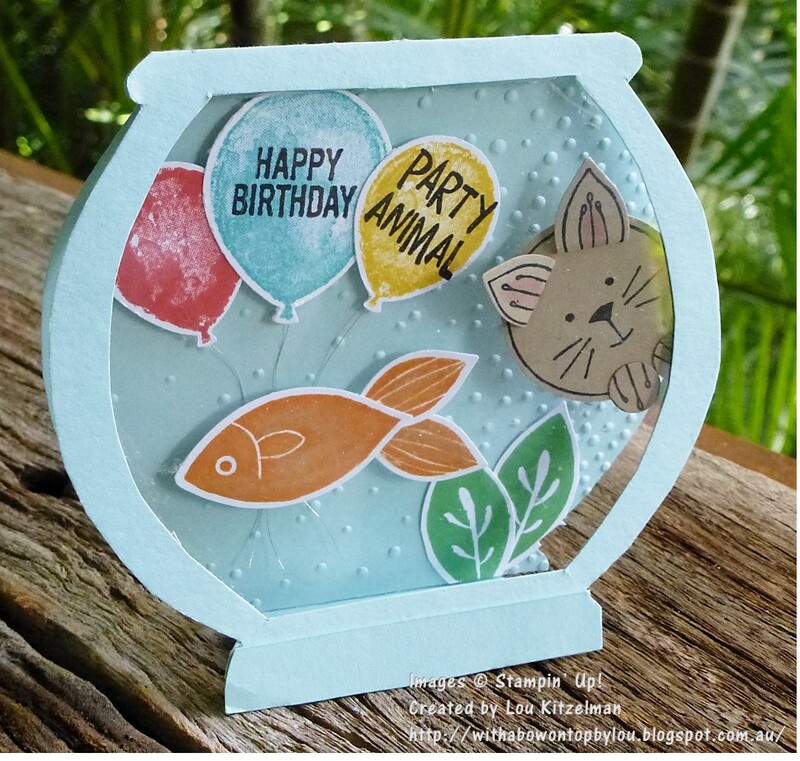 Attach your embellishment to these circles. Do you have a crafty resolution? I'd love to hear what it is. There is only today and tomorrow left to order from the Holiday catalogue. 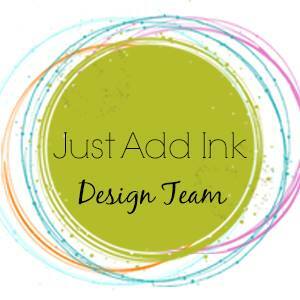 You can order through my Stampin' Up! shop. 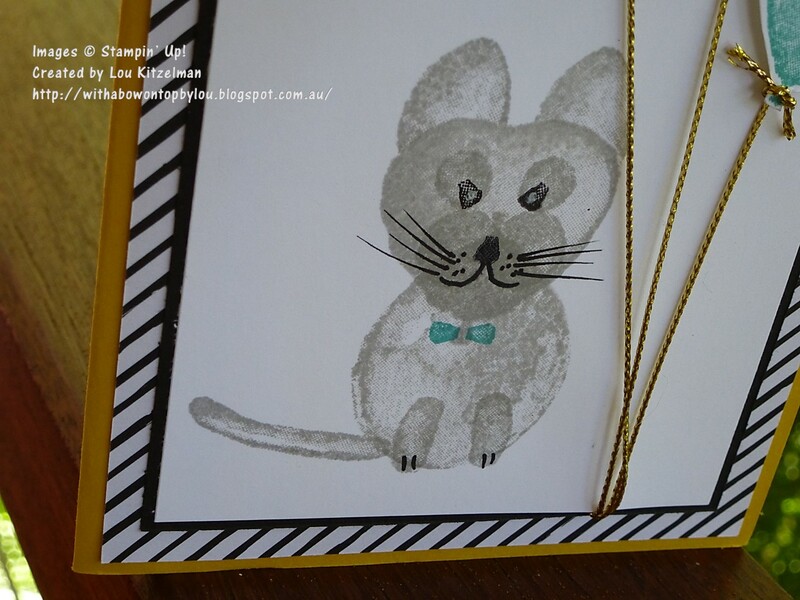 Just click on either link at the top right of my blog and products can be sent straight to your door anywhere in Australia.